The one and only goal of this Smooth Criminal mask is to prevent wrinkles. Organic clay will tighten your skin and pores and increase your skin’s elasticity. The clay can get all over the place when you’re making this mask, so use this mask right away as soon as you make it. We named this mask Smooth Criminal because it will leave your skin so smooth that it should be illegal. It’s honestly insane how you can get real results using only natural and plant-based ingredients. Organic clay will absorb all the oil from your skin and tighten up your skin. Long known for it’s detoxifying benefits and also has lightening and brightening elements. Apple cider vinegar will draw out the toxins in your face, fight fine lines and wrinkles, help you balance pH, acts as an antibacterial and antiviral and leaves your skin glowing. It’s pretty much liquid gold for your face. Virgin coconut oil naturally moisturizes your skin much better than the average lotion. Commercial lotions and moisturizes often contain a lot of water, so once your lotion dries out, your skin will dry out. Coconut oil will help provide real moisture and strengthen your skin. Orange zest can help remove blemishes, dark circles and help brighten your skin. 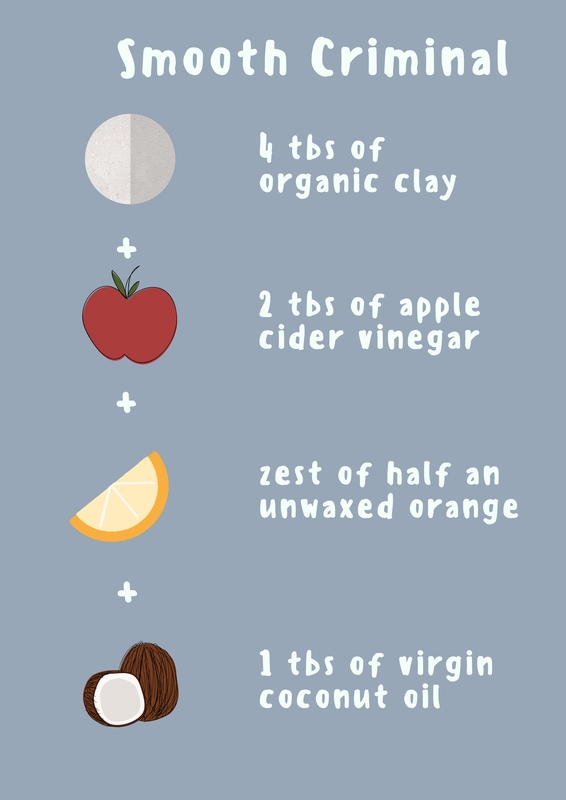 This will help provide you with a natural glow. Also, keep in mind when you’re coconut oil that you warm up the coconut so that it’s mixable in your mask. The graphic below features our exclusive recipe for the Smooth Criminal mask. First add in the clay into the bowl and incorporate the rest of the ingredients. Because this one has a lot of perishable ingredients, I would make this mask right before you’re planning on doing the mask to that it’s fresh. Once you try this smooth criminal mask, comment below and let us know how it goes.